With the upgrade to ffmpeg 4.0+ in various GNU/Linux distributions. I can't watch MP4/h264 videos on some of them. I haven't any problem using Siduction (debian sid), SparkyLinux (debian testing), & openSUSE Tumbleweed (with SeaMonkey 2.49.4 & ffmpeg 4.0+). But when using Antergos (Arch), or VoidLinux, I can't see any MP4/h264 video. Where they add 'WONTFIX' for Firefox 52 ESR (and obviously for SeaMonkey either). So, my question is simple. Can you add support for ffmpeg 4.0 and higher? Last edited by ElTxolo on September 18th, 2018, 11:06 am, edited 1 time in total. 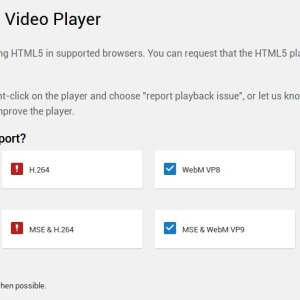 So there has to be specific support for specific ffmpeg versions on the browser end. And different distro may ship with different versions of ffmpeg. Sounds like it could be a bit of a mess, at times. Any reason you couldn't plug in an older version of ffmpeg for those browser/distro that aren't clicking, ffmpeg 3.4.1 or so? If 2.53 turns out ok I will look into it for a future 2.49. Thank you very much, for your effort and support. A few days ago, I installed SeaMonkey 2.53 (WG9's unofficial/unstable version - Build identifier: 20180911130006) in VoidLinux. So, the question is, when will SeaMonkey 2.49.5 be available and if will it support ffmpeg 4.0+? BTW, I want to thank WG9's work on SeaMonkey 2.53. But unfortunately, from my point of view, this is NOT a version for everyday use. (It consumes twice as much RAM as SeaMonkey 2.49.4, it has giant favicons on the bokmarks sidebar ... etc). Last edited by ElTxolo on September 18th, 2018, 6:51 am, edited 1 time in total. I still need to backport. The sec fixes came first. > BTW, I want to thank WG9's work on SeaMonkey 2.53. But unfortunately, from my point of view, this is NOT a version for everyday use. Not here. A lot less than 2.49. Might be add-on related. > it has giant favicons on the bokmarks sidebar ... etc). Which OS? Might be theme related. This has the Firefox library ported. If you find an error in the css please file a bug. I see that voidLinux is a rolling release so no version. Which gtk3 ? frg wrote: I still need to backport. The sec fixes came first. ElTxolo wrote: BTW, I want to thank WG9's work on SeaMonkey 2.53. But unfortunately, from my point of view, this is NOT a version for everyday use. I don't know what the reason for the overconsumption of RAM is. But disabling six (minus uBlock) of the seven extensions that I use the consumption is practically the same. Anyway, I'm not interested in using this version (2.53) or higher versions of SeaMonkey. That's why yesterday I deleted it. ElTxolo wrote: it has giant favicons on the bokmarks sidebar ... etc). I'm sorry, but it was a mistake on my part. The classic PEBKAC. I was using a custom theme. That is obviously NOT compatible with the changes made in this SeaMonkey version. sidebar favicons have the correct size. I want to apologize again to you for causing this misunderstanding. Not seeing that on my end, Win7. check Bills site for the next daily release. Just gave him the ffmpeg 4 patch. wrt. 2.53. I would rather drop 2.49 now but 2.53 has l10n changes we can't possibly backport.. Mostly my pet project on the way to 2.57 which I just need to bring up to current security. Aside from this I find it much superior to 2.49.x Most of the so called Quantum improvements are already in and it still has full support for classic extensions. I use it daily now. Great. I will see that it makes it into the next version. Still no ETA because ewong is still building up the new infra. frg wrote: Great. I will see that it makes it into the next version. Still no ETA because ewong is still building up the new infra.